Recently I’ve released a Ruby Apache Kafka microframework, however I don’t expect anyone to use it without at least a bit information on what it can do. Here are some measurements that I took. In general, it will distribute TCP connections across threads evenly. So, if you have 20 controllers and 5 threads, each thread will be responsible for checking 4 sockets, one after another. Since it won’t do this simultaneously, Karafka will slow down. How much? It depends – if there’s something on each of the topics – you will get around 24% (per controller) of the base performance out of each connection. 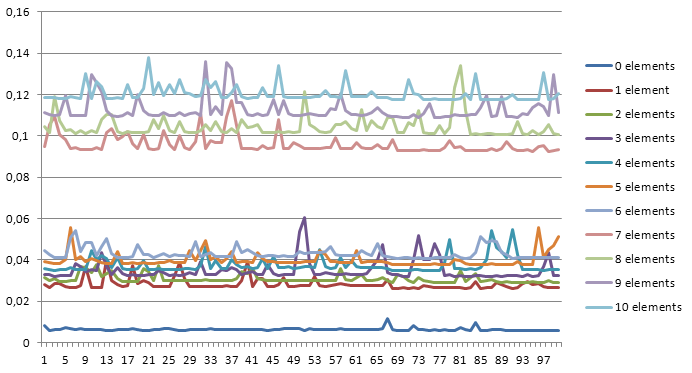 For each of the benchmarks I was measuring time taken to consume all messages that were stored in Kafka. There were no business logic involved (just messages processing by the framework). My local Kafka setup was a default setup (no settings were changed) introduced with this Docker containers. I’ve tested up to 5 topics – each with 1 000 000 messages loaded. Since Karafka has lazy loading for params – benchmark does not include time that is needed to unparse the messages. Unparsing performance strongly depends on a parser you pick (defaults to JSON) and messages size. Those benchmarks measure maximum throughput that we can get during messaging receiving. Note: all the benchmarking was performed on my 16GB, 4 core i7 processor, Linux laptop. During the benchmarking I’ve been performing other tasks that might have small impact on overall results (although no heavy stuff). With a single thread it is pretty straightforward – the more controllers we have, the less we can process per controller. There’s also controllers context switching overhead that consumes some of the power, allowing us to consume less and less. Switching between controllers seems to consume around 11% of a single controller performance when we tend to use more than 1 controller in a single threaded application. Context switching between controllers in a single thread will cost us around 1% of a general performance per one additional controller (if you’re eager to know what we’re planning to do with it scroll down to the summary). On one side it is a lot, on the other, with a bigger application you should probably run Karafka in multithreaded mode.. That way context switching won’t be as painful. General performance with 2 threads and 2 controllers proves that we’re able to lower switching impact on a overall performance, gaining around 1.5-2k requests per second (overall). 5 controllers with 3 threads vs 5 controllers with 1 thread: 7% better performance. The overall performance of a single Karafka framework process is highly dependent on the way it is being used. Because of GIL, when we receive data from sockets, we can only process incoming messages from a single socket at a time. So in general we’re limited to around 30-33k requests per second per process. It means that the bigger the application gets, the slower it works (when we consider total performance per single controller). However this is only valid when we assume that all the topics are always full of messages. Otherwise we don’t process, we wait on the IO and Ruby can process incoming messages from multiple threads. That’s why it is worth starting Karafka with a decent concurrency level.